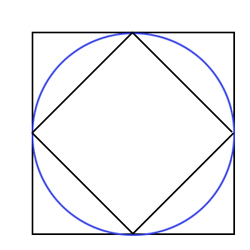 Since we have so Dividing by 4 gives so the round peg in a square hole gives the better fit. Couldn't you also consider this problem from the direction of a pressure fit? In this case, if the height of each peg is the same then the "pressure fit" is equal for both the rectangular prism and the cylindrical hole described above. A rectangular prism peg with the same height, h would contact a cylindrical hole at it's 4 edges. Again the pressure would be equal. Pressure = force*4h*negligible width of each contact line. A related problem which is fun, is to design a peg which fits into a triangular hole, a square hole, and a circular hole leaving no gaps. I’ve read this 5 times and it still doesn’t make sense. Which axis are you talking about? If the z-axis, you are wrong, both can rotate. Any other, you are still wrong, neither can rotate as they are pegs.